We know water is everywhere and kids love the water, but drowning is the leading cause of injury-related death among children 1-4. Whether it’s a trip to the beach or a dip in the community or backyard pool, you can ensure that swimming is as safe as it is fun by following a few basic safety tips. Learn the ABC’s of Drowning Prevention to keep your children safe. Adult supervision is key to drowning prevention. Always assign a “water watcher” who knows how to swim. Provide active adult supervision 100% of the time when children are in or near the water. Do not drink alcohol while supervising children. Children under 5 should be kept within arm’s reach while in water. Water wings, noodles, inner-tubes and life jackets should never take the place of adult supervision for children ages 0-5. Know where your children are at all times. 69% of children who drowned in swimming pools were not supposed to be in or around the water. If a child is missing, check the pool first. Install, check and always use a child-proof barrier around your pool/spa area. The only proven effective barrier is a 5 foot tall non-climbable fence with self-closing, self-latching gates that separate the pool from the house and yard. Remove toys from the pool area – they attract young children to the pool. Keep chairs, tables and other climbable items away from the pool barrier. Learn CPR (Cardiopulmonary Resuscitation) and rescue breathing. Call 911. Start CPR and rescue breathing at pool side – this can save a life while the ambulance is on the way. 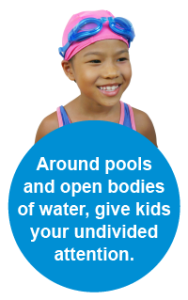 Make sure all children and adults in your family go to swim lessons and water safety training. But remember, these classes do not replace of the need for adult supervision and barriers. To find swim classes ask at your local community pool, family resource center, or parks and recreation district locations. To find CPR classes contact your local Red Cross chapter, family resource center, or American Heart Association.